To create a precise X-ray band and make the Linac Coherent Light Source even more “laser-like,” researchers installed this chamber with a slice of diamond crystal. The new hardware sits halfway down the 130-meter bank of magnets where the X-rays are generated. Light waves that are in phase with each other is called coherent light. Two waves are called coherent when the crests (highest part) and the troughs (lowest part) of each wave are aligned with each other. An example of coherent light are light emitted by lasers. The light is focused and as can be observed with a laser pointer, travel in a straight line without any scattering. Sunlight is an example of incoherent light. It is scattered and not focused on one area or region as a laser can. Light from a regular flashlight since it travels in a "cone" is also incoherent light. With a thin sliver of diamond, scientists at the U.S. Department of Energy's (DOE) SLAC National Accelerator Laboratory have transformed the Linac Coherent Light Source (LCLS) into an even more precise tool for exploring the nanoworld. The improvements yield laser pulses focused to higher intensity in a much narrower band of X-ray wavelengths, and may enable experiments that have never before been possible. In a process called "self-seeding," the diamond filters the laser beam to a single X-ray color, which is then amplified. Like trading a hatchet for a scalpel, the advance will give researchers more control in studying and manipulating matter at the atomic level and will deliver sharper images of materials, molecules and chemical reactions. Part of the SLAC team who worked on self-seeding is shown alongside the hardware in the LCLS Undulator Hall. They are (from left to right) John Amann, Henrik Loos, Jerry Hastings and Jim Welch. "The more control you have, the finer the details you can see," said Jerry Hastings, a SLAC scientist and co-author on the research, published this week in Nature Photonics. "People have been talking about self-seeding for nearly 15 years. The method we incorporated at SLAC was proposed in 2010 by Gianluca Geloni, Vitali Kocharyan and Evgeni Saldin of the European XFEL and DESY research centers in Germany. When our team from SLAC and Argonne National Laboratory built it, we were surprised by how simple, robust and cost-effective the engineering turned out to be." Hastings added that laboratories around the world are already planning to incorporate this important advance into their own X-ray laser facilities. To create a precise X-ray wavelength band and make the LCLS even more "laser-like," researchers installed a slice of diamond crystal halfway down the 130-meter bank of magnets where the X-rays are generated. Producing the narrower wavelength band is just the beginning. 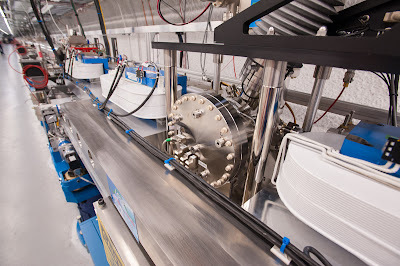 "The resulting pulses could pack up to 10 times more intensity when we finish optimizing the system and add more undulators," said Zhirong Huang, a SLAC accelerator physicist and co-author, who has been a major contributor to the project. The first tests of the LCLS self-seeding system have generated intense excitement among scientists the world over. Representatives from other X-ray laser facilities, including Swiss FEL, SACLA in Japan and the European XFEL, came to help, and also learn how to implement it at their own sites. According to Paul Emma, a co-author who was a key figure in the original commissioning of the LCLS and in implementing self-seeding, "the entire group of observers was smiling from ear to ear." Emma, now working at Lawrence Berkeley National Lab, has a history of making tough jobs look easy, but he would only say, "I was very happy to see it work."